The site where James Rorke had established a trading store and a ford across the Buffalo River has become known worldwide, partly because of the film “Zulu”, filmed in 1963, starring Stanley Baker and a young Michael Caine as Lts. Bromhead and Chard, and directed by Cy Enfield, and partly because the battle resulted in a record 11 Victoria Crosses being awarded to the British troops involved. After Rorke’s death in 1875 the land passed to the Swedish mission. The hill behind the settlement was known as the Oskarberg in honour of the King of Sweden, but to the Zulus it was known as ‘Shiyane’. The house built by Rorke was occupied by the mission, the storehouse had been turned into a chapel and the cattle enclosure was a well-built stone rectangle. On 10 January 1879 the British forces commandeered the house and chapel – the house became a hospital and the chapel the commissariat store. 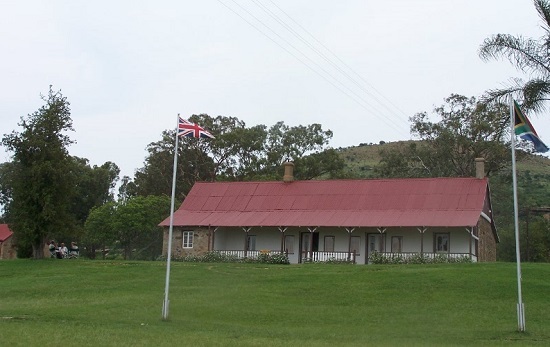 With the invasion of Zululand on 11 January, some 139 men were left at Rorkes Drift, either in hospital, to guard the pont, or to ensure the movement of supplies into Zululand following the British army. At about 3:15 on the afternoon of 22 January, Lts. Adendorff and Vane galloped in with the news of the British defeat at Isandlwana. As they rode off to Helpmekaar, Lt. Chard and Lt. Bromhead began frantically with preparations to defend Rorkes Drift. A wall of mealie bags was built from the far corner of the Hospital to the edge of the well built stone kraal. The hospital was barricaded and when the mounted Basutos and the detachment of N.N.C. rode off towards Helpmekaar, a wall of biscuit boxes was built from the store to the rocky ledge to form a second line of defence. Soon after 4 p.m. the lookout on Shiyane warned of the approach of the Zulus. Lt. Chard had about 110 fit men to defend the station against the 3 000 to 4 000 Zulus. 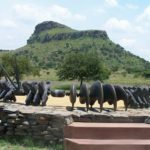 The Zulu force consisted mainly of the Undi Corps, who had occupied the right flank at Isandlwana and had taken almost no part in the fighting. 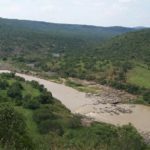 They had crossed the Buffalo river about 2 miles downstream from Rorkes Drift and approached from behind Shiyane hill. The first attack began at about 4:30 p.m. The Zulu forces swung around the hill towards the south wall of the defences. Some of the warriors took shelter behind the cookhouse. When this attack was beaten off, the Zulus moved around to attack the northwest. The Zulus came so close to the defences that they could grab the soldier’s bayonets. Fierce hand-to-hand combat took place. From the Oskarberg, Zulus maintained a harassing fire with rifles picked up on Isandlwana battlefield. The Zulu forces broke through onto the verandah of the hospital and set the thatch roof on fire, forcing the defenders to evacuate this building. As all the rooms opened on to the verandah and there were no interleading doors, this forced the men to defend each doorway while others dug through the walls with their bayonets to evacuate the sick. While this evacuation of the hospital building was taking place, a small redoubt of mealie bags was built between the biscuit box wall and the stone kraal as a final defence. The burning thatch roof lit up the area and made it possible for the British soldiers to see the attacking Zulus even after night fell. The Zulus continued to attack at intervals all night and finally withdrew shortly after 4 a.m. The defenders remained at their posts until the arrival of Lord Chelmsford and his column at about 7 a.m. This column had marched from Isandlwana at daybreak. The British lost 17 men and the Zulus an estimated 500. A record number of 11 Victoria Crosses were awarded to the defenders of Rorke’s Drift.